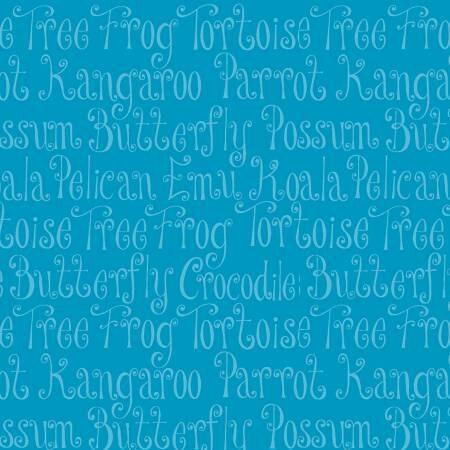 Aussie Mates Cotton fabric Designed by Delphine Cubitt for Henry Glass & Co., this cotton print fabric from the Aussie Mates collection is perfect for quilting, apparel and home decor accents. Colors include shades of blue. A fun and beautiful addition to the Aussie Mates cotton crib panel. A beautiful tone on tone shade o blue to accent the vibrant colors in the crib panel. This fabric measures 44 inches wide. All fabric from The Quilted Nursery Fabric store is cut directly from the bolt and is sold by the yard. If you require special yardage please contact The Quilted Nursery Fabric Store and we will be happy to assist you with your request. All purchases are shipped same day!